To wrap up Roboat’s second year of research – the research program on autonomous vessels that helps solving urban challenges of the city of Amsterdam – the first autonomous Roboat prototypes were demonstrated at Marineterrein Amsterdam on Friday, October 5th. The program is a collaboration between Massachusetts Institute of Technology (MIT) and Amsterdam Institute for Advanced Metropolitan Solutions (AMS Institute). 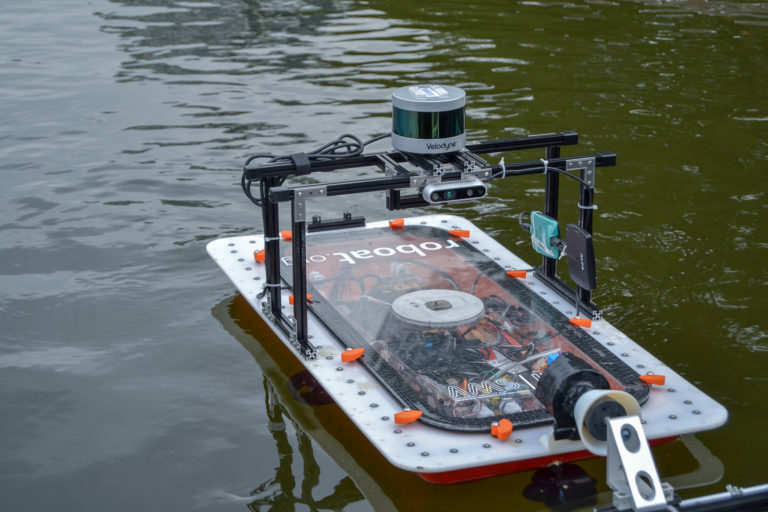 Researchers from TU Delft Robotics Institute are involved as well: Javier Alonso en Michal Cap developed methods for planning safe trajectories in busy canals and for controlling large fleets of vehicles providing mobility on demand. During the second year of research, important results were achieved, including autonomy of the vessels and a latching system to link and dock individual vessels. In addition, the feasibility of various use cases in the field of waste logistics and food distribution were explored.